Carolina is preparing as if Zion will play, even though he won’t. 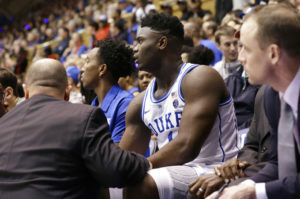 The Tar Heels already had their game plan for February 20th at Cameron, and Roy Williams said they will be ready whether Zion plays or not for Duke. Without him, the match-ups favor the home team, as proven for the last 39 and a half minutes of the first game. Coby White versus Tre Jones will, hopefully, be better than they were in Durham, where White shot 3-for-14 and Jones 1-for-11. Each made one 3-pointer and combined to miss 12 other attempts. Even if the Dukies can control Carolina’s transition game, they will have to score enough to win. R.J. Barrett will get his points for the Blue Devils but he is more of an NBA two guard and is likely to give as many back against Luke Maye and Cameron Johnson and the often-uncovered Garrison Brooks. Cam Reddish, perhaps Duke’s worst defensive starter, won’t be much help inside. And Marquise Bolden is soft as butter. So how can a Zion-less team beat the Tar Heels on their home floor? You have to go back 18 years for the answer. In 2001, Carolina faced Duke on Brendan Haywood’s Senior Day after stunning the Blue Devils at Cameron earlier in the season. But this time, Duke was without starting center and future pro Carlos Boozer, who broke a bone in his foot against Maryland three days before the rematch. National Player of the Year Shane Battier said after the game that Coach K “just told me to run around and make plays.” And he did with 25 points, 11 rebounds, 5 blocks and 4 steals. He also drained four 3-pointers, which was part of Mike Krzyzewski’s game plan to go with a smaller lineup and shoot a lot of three’s – as in 38. So look for the Dukies to again shoot 30-plus 3-pointers. In the first game, they took 39 and canned only 9. If Luke and Kenny want to earn their 118th career victory on their Senior Day, the Heels have to contain R.J. as best they can and mind the Duke long balls they know are coming. Unless, of course, Zion plays, which he won’t.